Chasing Data – Are You Datablogging Yet? It’s strange to think that the web search industry is only 15 years or so old, and in that time the race has been run on indexing and serving up results for web pages, images, videos, blogs, and so on. The current race is focused on chasing the mobile (local) searcher, making use of location awareness to serve up ads that are sensitive to spatial context, but maybe it’s data that is next? Want to ‘datablog’ your running miles or your commute times or your grocery spending? 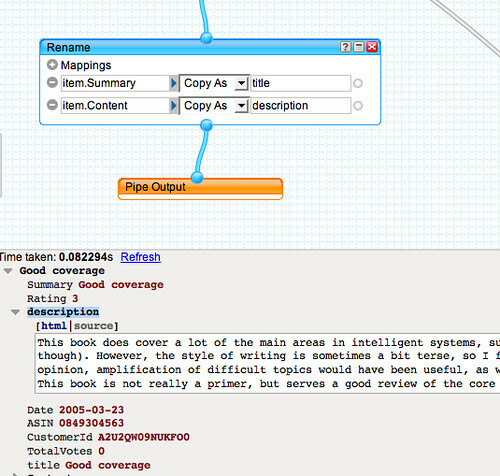 DataDepot provides a simple way to track any type of data over time. 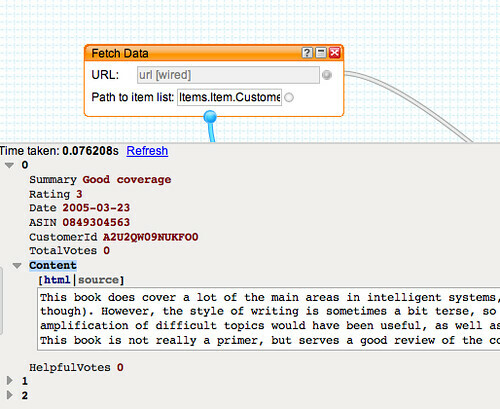 You can add data via the web or your phone, then annotate, view, analyze, and add related content to your data. Weather details – High and the low temperatures on weather.com for a specific zipcode. Monster Job Listings – Number of job results from Monster.com for the given query in a specific city. 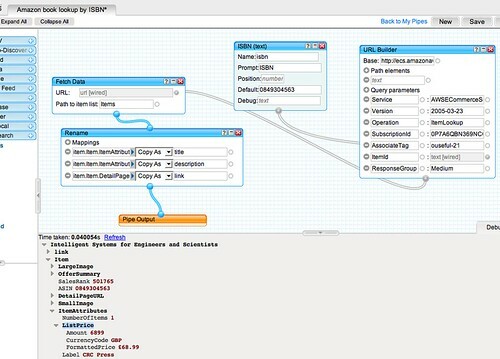 Now call me paranoid, but I suddenly twigged why I thought the Google announcement about an extension to the Google Visualisation API that will enabl[e] developers to display data from any data source connected to the web (any database, Excel spreadsheet, etc. ), not just from Google Spreadsheets could have some consequences. And finally, it’s probably also worth mentioning that even if we don’t give the Goog the keys to our databases, plenty of us are in the habit of feeding public data stores anyway. For example, there are several sites built specifically around visualising user submitted data, (if you make it public…): Many Eyes and Swivel, for example. And then of course, there’s also Google Spreadsheets, DabbleDB, Zoho sheet etc etc. 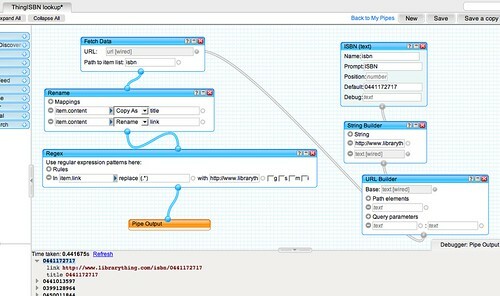 PS see also Track’n’graph, iCharts and widgenie. Or how about Daytum and mycrocosm. 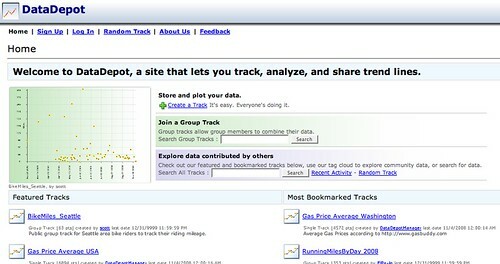 Author Tony HirstPosted on November 4, 2008 November 22, 2008 Categories Anything you wantTags datablog2 Comments on Chasing Data – Are You Datablogging Yet? In the previous couple of posts, I’ve rambled about web apps that will find a book from its cover and a song just by playing it and your online contacts across a myriad of services from your username on a single service. But today I saw something that brought home to me the consequences of aggregating millions of tiny individual actions, in this case photo uploads to the flickr social photo site. 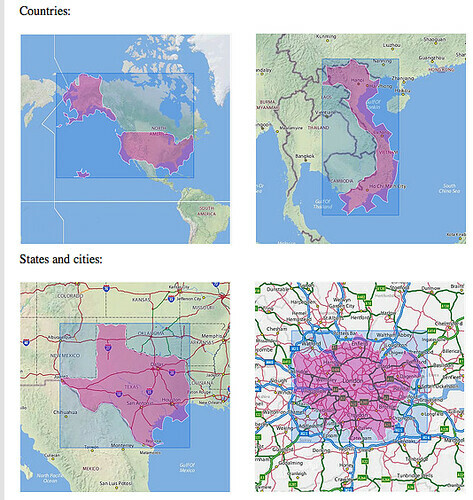 Form my reading of the post, the purple overlays in the images above – not the blue bounding boxes – are generated automatically by clustering geotagged and placename tagged images and extrapolating a well contoured shape around them. 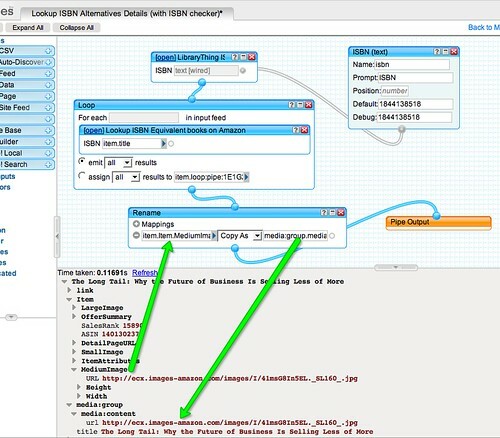 That is, from the photos tagged “London” [that is, photos that are tagged with London in Yahoo’s WOE service], the algorithm creates the purple “London city” overlay in the above diagram. And it struck me that even the relatively unsophisticated form of signals intelligence that is traffic analysis was capable of changing the face of war. So what are the consequences of traffic analysis at this scale? What are the possible consequences? What are we walking into? So to add to the mix, here’s a couple more things that the web made easy this week. Firstly, the Google Visualisation API was extended so that it could consume data in a simple format from your own data sources. That is, if you allow your own database to output data in a simple tabular structure, the Google visualisation API makes it trivial to generate charts and graphs from that data. Secondly, Google added RSS feed support to their Google alerts service. This makes it easy to subscribe to an RSS feed that will alert you to new results on Google for a particular search. What really surprised me was how, after setting up a couple of alerts, they appeared without me doing anything (or maybe that should be – without me changing something to say “no”?) in my Google Reader account. Small components is one thing. Small components loosely coupled is another – and one where many of us see value. Small components automatically wired together is yet another thing – and one that is increasingly going to happen. A consequence I hadn’t anticipated of setting up a Google RSS alert was that the feed appeared automatically in my feed reader. Yesterday, an unanticipated consequence of me adding my blog URL to my Google Profile page was that several other URLs I control were automatically suggested to me as things I might want to add to my profile. Whenever I go into Facebook, the platform suggests a list of people I might know to me, whom I might want to “friend”. Now this recommendation may be because we share a large number of friends, or it might be that I’ve appeared in the same photograph as some of these people… How would Facebook know? Maybe Mircosoft, their search provider, told them: Why “People” Tags? describes how the beta version of Microsoft Live Photo gallery automatically identifies faces in photos and then prompts you to tag them with people’s names… Google already does this, of course, in Picasa, with its “name tags“. And finally…a chance clickthru from someone on the Copac developments blog, which lists OUseful.info in the blogroll, alerted me through my blog stats to this post on Spooky Personalisation (should we be afraid?) which discusses the extent to which “adaptive personalisation” may appear “spooky” to the user. Several times tonight, I realised that the future is increasingly happening around me, and it’s appearing so quickly I’m having problems even imagining what might come next. So just imagine the “workflow” here: you hear a song playing, fire up the Shazam app, it recognises the song, then you can watch someone play a version of the song (maybe even the same version on Youtube. Another (mis)quote, this time from Arthur C. Clarke: “any sufficiently advanced technology is indistinguishable from magic”. And by magic, I guess one thing we mean is that there is no “obvious” causal relationship between the casting of a spell and the effect? And a second thing is that if we believe something to be possible, then it probably is possible. PS Google finally got round to making their alerts service feed a feed: Feed me! Google Alerts not just for email anymore, so now you can subscribe to an alerts RSS feed, rather than having to receive alerts via email. If you want to receive the updates via Twitter, just paste the feed URL into a service like Twitterfeed or f33d.in. Time to Get Scared, People? 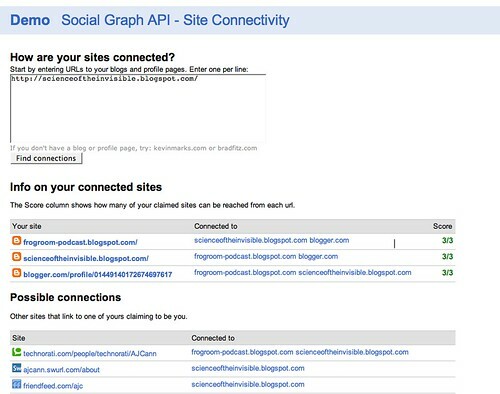 Last week, I posted a couple of tweets (via http://twitter.com/psychemedia) that were essentially doodles around the edge of what services like Google can work out about you from your online activity. So what did I look at? The possible connections reveal Alan’s possible identity on Technorati, Twitter, identi.ca, friendfeed, swurl, seesmic and mybloglog. PPS does the web know when your birthday is??? Bewar of “Happy Birthday me…”. See also My Web Birthday. Author Tony HirstPosted on November 2, 2008 February 13, 2010 Categories Search13 Comments on Time to Get Scared, People? And there you have it – a pipe that looks up the different editions of a particular book using ThingISBN, and then aggregates the Amazon reviews for all those editions. And friends, somewhere in Washington enshrined in some little folder, is a study in black and white of my fingerprints. And the only reason I’m singing you this song now is cause you may know somebody in a similar situation, or you may be in a similar situation, and if your in a situation like that there’s only one thing you can do and that’s walk into the shrink wherever you are, just walk in say “Shrink, You can get anything you want, at Alice’s restaurant.”. And walk out. You know, if one person, just one person does it they may think he’s really sick and they won’t take him. And if two people, two people do it, in harmony, they may think they’re both faggots and they won’t take either of them. And three people do it, three, can you imagine, three people walking in singin a bar of Alice’s Restaurant and walking out. They may think it’s an organization. And can you, can you imagine fifty people a day, I said fifty people a day walking in singin a bar of Alice’s Restaurant and walking out. And friends they may thinks it’s a movement. And I think that’s what we’ve got here – a movement… You can get anything you want, at Alice’s restaurant..
As Amazon improves access to the long tail of books through Amazon’s marketplace sellers and maybe even their ownership of Abebooks, it’s increasingly easy to find multiple editions of the same book. So when I followed a link to a book that Mike Ellis recommended last week (to The Victorian Internet in fact) and found that none of the editions of the book were in stock, as new, on Amazon, I had the tangential thought that it’d be quite handy to have a service that would take an ISBN and then look up the prices for all the various editions of that book on Amazon. 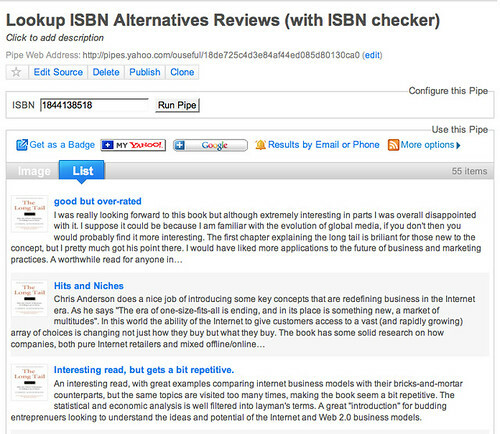 Given an ISBN for a book, there are at least a couple of ways of finding the ISBNs for other editions of the book – the Worldcat xISBN service, and ThingISBN from LibraryThing (now part owned by Amazon through Amazon’s ownership of Abebooks; for who else Amazon owns, see Amazon “Edge Services” – Digital Manufacturing). So here’s a couple of Yahoo pipes for looking up the alternative editions of a book on the Amazon website, after discovering those editions from ThingISBN. 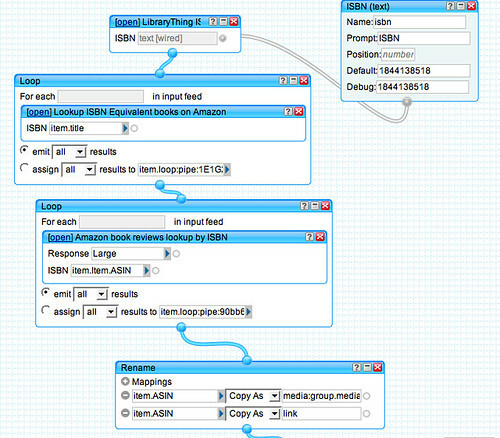 What this pipe does is construct a URL that calls for the list of alternative ISBNs for a given ISBN. 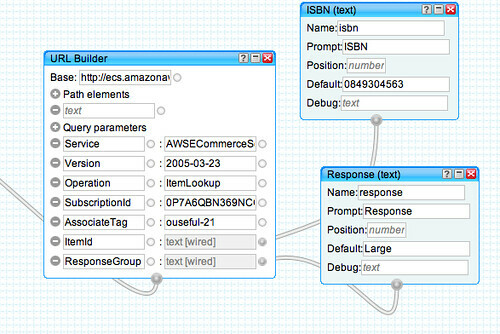 That is, it constructs a URL of the form http://www.librarything.com/api/thingISBN/ISBNHERE, which returns an XML file containing the alternative ISBNs (example), grabs the XML file back using the Fetch Data block, renames the internal representation of the grabbed XML so that the pipe will generate a valid RSS feed, and output the result. 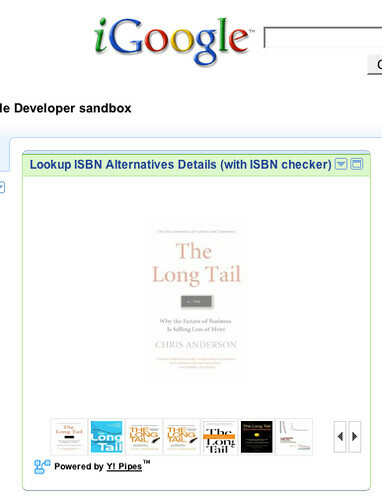 So now we have an RSS feed that contains a list of alternative ISBNs, via ThingISBN, for a given ISBN. 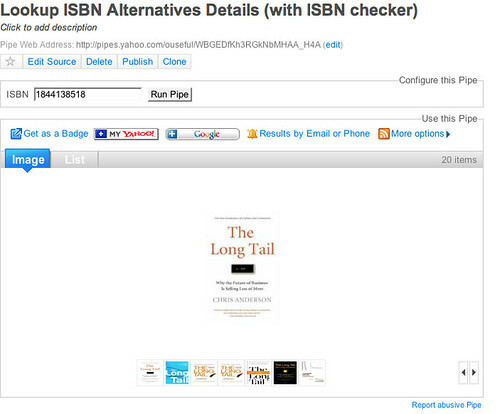 So now we have a pipe that will look up the details of a book on Amazon given its ISBN. Now what? Well, if you use this pipe in your own mashup, you may find that if you construct a URL that calls a pipe with a given ISBN, if you don’t handle the ISBN properly in your own code, you can pass a badly formed ISBN to the pipe. The most common example of this is dropping a leading 0 on the ISBN – so e.g. you pass 441172717 rather than 0441172717. 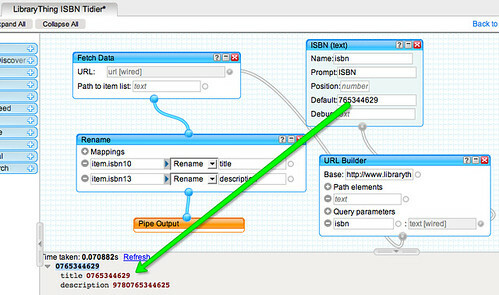 Good – so now we can defensively programme the front end of our pipe to handle badly formed ISBNs by sticking this pipe at the front of the compound pipe that calls ThingISBN and then loops through Amazon calls. 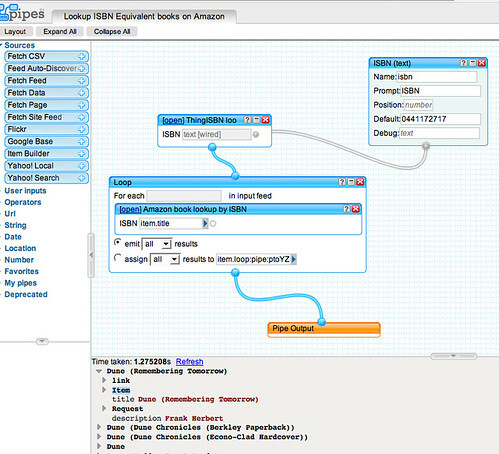 But there’s something we can do at the other end of the pipe too, and that is make use of a ‘slideshow’ feature that Yahoo pipes offers as an interface to the pipe. 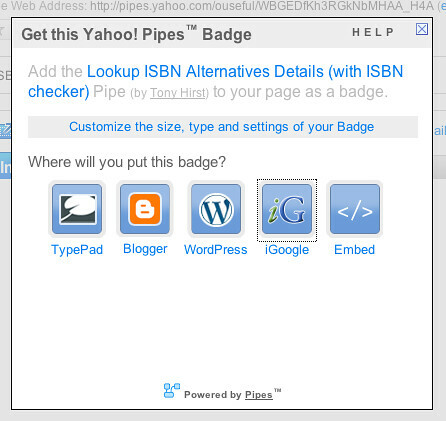 If the elements of a feed contain image items that are packaged in an appropriate way, the Yahoo pipes interface will automatically create a slidesho of those images. What this means is that if we package URLs that point to the book cover image of each alternative version of a book, we can get a slideshow of the bookcovers of all the alternative editions of that book.